According to KnowYourMeme, the "Wrong Neighborhood" meme originated with a remix by SHOKK in 2014, one which playfully combined the instrumental to glue70's "Casin" with the vocals from Eminem's hit single "Shake That" featuring Nate Dogg. Even though this might be true on the surface it does leave out a few important facts and also leaves a few questions completely unanswered. The first thing that's unaddressed here is glue70's "Casin" was in itself a remix, and if you listen to it for a little bit it's not hard to pick up on the fact the original song is "Joanna" by Kool & the Gang. You can even hear the original saying "you're the one, the one for me" although most of the other vocals are chopped up heavily. Given the degree to which it's rearranged and extra electronic synthesizer sounds are laid over it, you could almost argue it's a wholly original song, but even so it's wholly made up of pieces of ANOTHER song and given the remix uses large portions of the melody at a very similar tempo, even Siri could pick up on it. In fact I just tested this theory - if you start the song from the beginning she says "Casin by glue70" but if you start at 0:41 she says "Joanna by Kool & the Gang." It's not hard to hear it at all. So even though SHOKK gave credit to his sources, it's not clear that glue70 did the same, though I'm going to give glue70 all the credit for a clever re-purposing of a funk music classic from my childhood. The question that's still unanswered though is why SHOKK called his remix of a remix "You Reposted in the Wrong Neighborhood." It took a lot of digging around but I finally found a video by a user called "Behind the Meme" who says that a YouTube video by novajam complaining about video game mods that used to be free being sold for profit was where loads of people using SHOKK's remix (of glue70's remix of Kool & the Gang) really got started in a big way. This STILL doesn't explain how these videos eventually came to be known as "wrong neighborhood" meme videos, because the original video by novajam (if indeed it's the first use of SHOKK) doesn't mention that phrase in the title. Nevertheless that's the way I discovered it, as a "suggested video" by YouTube, which just goes to show that once in a while those damn suggestions actually offer you something you'd want to hear. No matter what neighborhood you might be in, start with this picture of Shaggy from Scooby Doo wearing his full head of hair on his chin and his goatee on his head. 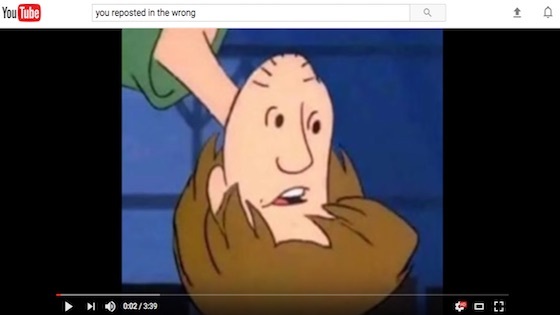 That image much like the entire reason these videos became "wrong neighborhood" videos is unexplained and hilarious - then enjoy the rest of this top ten as the remixes and videos take unexpected turns! 1.) Chillstation - "You Reposted in the Wrong Neighborhood"
2.) Galactic Hole - "You Requested in the Wrong Neighborhood"
3.) JerryTerry - "You Reposted in the Wrong Swamp"
4.) Paladin Luke - "You Reposted in the Wrong Club"
5.) HoodoHoodlumsRevenge - "You Reposted in the Wrong Gorilla"
6.) The Wub - "Spookin in the Wrong Neighborhood"
7.) Araszzxx - "You Reposted in the Wrong Neighborhood (Special Edition)"
8.) Sorox94 - "You Determined in the Wrong Neighborhood"
9.) HazeyRetro - "You Reposted in the Wrong RigbyHood"
10.) Armageddon Soldier - "You Reposted in the Wrong Friendly Neighborhood"